Courtney Mann, ETC: Guest Bloggers Wanted! With my last post in mind I've realized I probably won't blog as much this summer as I would like too. I won't even get back into my classroom until the middle of July since they are putting in new tile (YIPPIE) and I'd like to take a break of thinking about school until then. This is where you come in! I'm looking for guest bloggers for the month of June and July! You don't have to be a blogger, or even a writer. I would just like anyone who can share some teaching stories, strategies, or ideas that would benefit others. If you would like to help please comment with your e-mail or e-mail me at cljtz3@mail.missouri.edu! Hope to hear from you soon. Have a great week! P.S. How cute is this Father's Day font!? 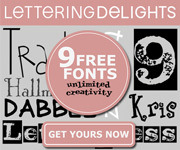 Now FREE at Lettering Delights! Click the link below to get your own. Hi! I'm your newest follower! I'd love to guest blog for you! I just graduated college and will be starting to teach in the fall. I'd love to share with your followers! I would love to guest post for you! :) I have a great project I'm working on right now that should be done by next week. Let's set up a date for my guest post!